Buying cheap pillar candles can sometimes be a good way to cut costs, but these products aren't always the best choice. Pillar candles are tall candles that are freestanding. They are relatively thick and often come in sizes between four and nine inches high. Pillar candles can be displayed on a plate or in special pillar candle holders made from glass, metal, or ceramic. Holders are often considered to be the safest choice, since they protect the candle from being accidentally knocked over and provide a place for melted wax to pool. 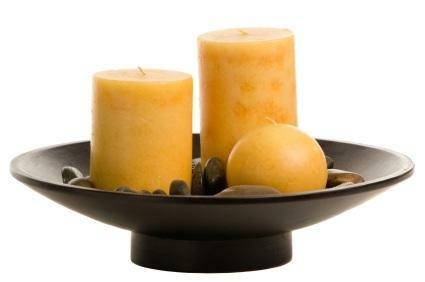 However, displaying candles on a plate allows for a more attractive centerpiece. How Much Should I Spend on a Candle? The prices of pillar candles can vary widely. At a discount store, you can find candles for $2 to $6. A large pillar candle can often be priced in the $20 to $30 range at a department store. Handcrafted or specialty candles can be $40 or more, depending upon the size. Candles made from soy wax or beeswax tend to be more expensive than candles made from paraffin wax. Aromatherapy candles made with essential oils will be more expensive than those which are made with synthetic fragrance oils. Candles that have carving, multiple layers of colored wax, or other details will be costlier as well. When should you save on candles? When should you splurge? You are planning a party and need to purchase a large quantity of candles for one-time use. More expensive candles will typically burn longer, but this isn't a problem if you're simply planning on using the candle for a party that will last only a few hours. You're not actually planning on burning the candles and simply want to purchase them for decorative use or to display inside a fancy candle holder. Cheap pillar candles can be just as attractive as their more expensive counterparts. You want to burn the candle to cover up unpleasant odors. If you're trying to camouflage household odors, more expensive candles are likely to have the quality fragrance you will need for this purpose. You have allergies or other special concerns. The lower grade fragrance oils used in cheap pillar candles can sometimes bother people with fragrance sensitivities. You're giving candles as a gift. Candles are often given as gifts for the holidays, house warming parties, thank you presents, or adult birthday celebrations. When giving a candle as a gift, however, it's best to buy the highest quality item that fits your budget. Dollar stores are a good place to start your search for cheap candles. Most stores, such as Dollar General and Dollar Tree, have a fairly large selection of candles in various sizes and colors. The fragrance selection tends to be a bit more limited, however. You're likely to find basic floral or citrus scents, but not the exotic fragrance combinations you'd see when shopping for Yankee Candles. Walmart, Target, and Kmart can be good sources of affordable pillar candles as well. For the best bargains, try to pick up gift sets around the holidays. Christmas, Valentine's Day, and Mother's Day are all excellent times to find cheap candles. Craft stores such as Hobby Lobby generally have a large selection of candles, including unscented candles for use in table centerpieces. For the best deals, check the store's website for coupons to use on your purchase. If you prefer to shop online, Candles 4 Less has a large assortment of both scented and unscented pillar candles. Many of them are sold in sets of three, six, 12, or 24, however. Barn Loft Candles also has a nice selection of discount pillar candles, with a tool that lets you search for options by color in order to coordinate your candles with your home décor.